I think I have waited about a year to finally read Mistwalker. And I do think the wait was worth it. 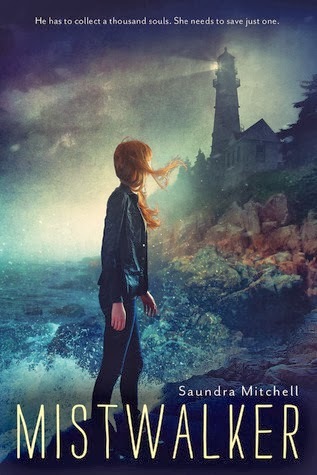 <3 This is the fourth book by Saundra that I have read, and I have enjoyed them all. I'm rating this a four star. Because I loved it, but it broke my heart. See, I was wishing so hard for something that didn't happen. But oh, I'm not sure how to talk about this book. Because Mistwalker was a beautiful book. Beautiful and heartbreaking. I really enjoyed the writing. And the characters were amazing. And I loved the story to pieces. But I kind of wanted more from the ending. Oh, it's perfect, but I wanted a tiny thing more. This story is told from the point of view of Willa and the Grey Man. Willa is pretty amazing. I did love her. But she frustrated me a little bit. With how she behaved around this one person. Hmm. But I did love her best friend and I think they had an awesome friendship. She kind of has a boyfriend. Seth. And I'm not sure how I felt about him. He seemed sweet and kind but I didn't really think he and Willa fit together as a couple, hih. I'm not going to say too much about this book. Just that it is a beautiful story and I enjoyed reading it. I got hooked early on and I couldn't stop reading until I had finished it. I enjoyed the writing and I liked the characters. For the most part. I did find Willa to be an interesting character. I enjoyed her family, though they are all broken over the death of her younger brother, Levi. And that broke my heart. But I loved reading about how they struggled; with family love and with money issues. It was very real. The other point of view is from the Grey Man. Who is actually a teenage boy. And his story is pretty heartbreaking and he gave me all the feels. I kind of loved him to pieces. And I wish his story had been happier. That is what bothered me about the ending. There is no romance between him and Willa. And I didn't really mind that at all. But oh, I wanted it. I wanted them together. Or at least to be friends. But they weren't even that. That broke my heart a little. Sniffs. Sequel one day, maybe? Fingers crossed. But anyway. I loved reading about the Grey Man. He's such an amazing character. And his story is so interesting. And I won't spoil it. But let's just say that there is some magic involved. And a curse. And it's heartbreaking but at the same time so interesting to read about. And kind of beautiful. I really enjoyed reading about it in this book. Sigh. But yes. I really wish we had seen more of him and Willa together. I wanted them to have a friendship. Grrr. And that is why this is a four star and not a five. I love Saundra Mitchell! I've never heard of this before though. This is not a part of her Springsweet series, is it? I have this book in my Kindle app, waiting to be read, after Cress and a pair of review books! I'm kinda glad to hear that romance was not big in this book! I haven't read this series but it sounds interesting! Great review! I've never come across Saundra's books before, but the reaction it evoked from you had me intrigued, I love stories which are written beautifully, and Mistwalker seems exactly like that sort of book. Thanks for putting this author on my radar! I recently read a review for this book that was pretty good...I'd not heard of it before. Now seeing your review I'm adding it to my TBR wishlist. So happy you enjoyed it though it didn't have that one thing you wanted to happen. [ Smiles ] "Mistwalker" appears to be most interesting! I've read wonderful things about this book and this author, I don't know why I haven't trie d her yet! Beautiful and heartbreaking reads are my favorite.